This month, as the massive mobilizations against the far-right, authoritarian candidate Jair Bolsonaro highlighted the importance of an active civil society and the role of women within Brazil's upcoming elections, other forms of citizen organization showed the extent to which political experimentalism can influence election cycles. One of these forms of experimentation was the project "Drugs are a case for Policy", in which a group of citizens decided to map the political candidates who support the reform of the drug policy in the country. As the LATINNO database allows cases to be measured and compared, we decided to dedicate September's newsletter to the democratic innovations that have previously engaged citizens in the different stages of national drug policy processes. In addition to sharing with you our most recent publication, this month's newsletter will also feature the launch of GIGAPP's-LATINNO Special Working Group and LATINNO's presence during GIGAPP 2018, the International Congress on Government, Administration, and Public Policies held in Madrid. The Spanish’s Research Group on Government, Administration, and Public Policies (GIGAPP), a network of over 1000 researchers working on government, public management, and public policy analysis, created a special working group to explore LATINNO’s database. The GIGAPP-LATINNO Special Working Group gathers nineteen researchers from seven countries with the aim to explore why specific democratic innovations have been replicated in various countries across the region, how does the country-specific context of each nation influences the impact of political experimentalism, and what institutional factors have allowed participatory initiatives to be successful. 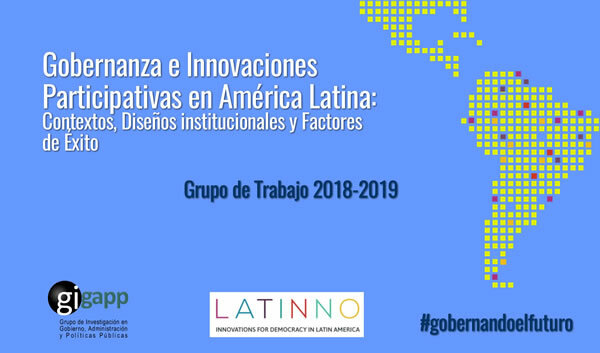 Building upon the data and results of LATINNO's project, the group aims to conduct qualitative and applied research, case studies and in-depth analysis of the democratic innovations and tendencies identified by the LATINNO database. 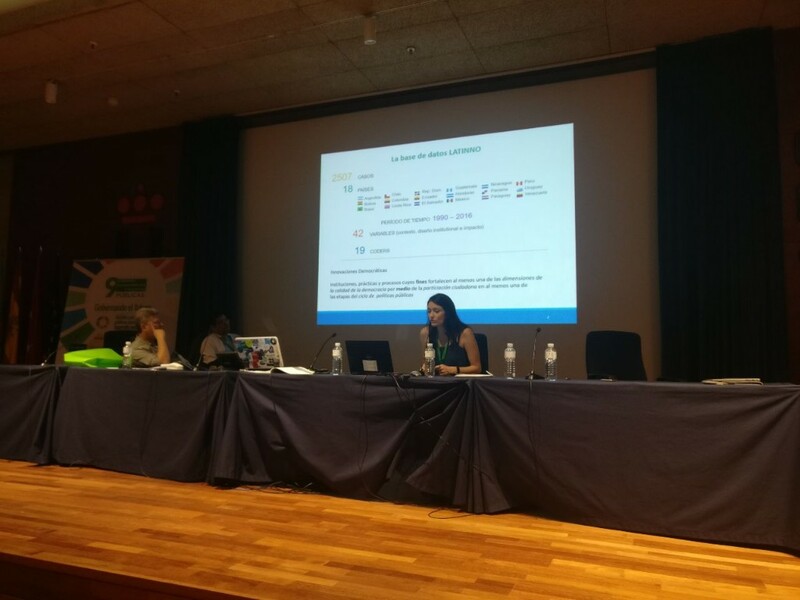 This month, Melisa Ross, LATINNO's research fellow, presented some of the project's results during the IX International Congress on Government, Administration, and Public Policies held in Madrid. During the first day of the Congress, she shared recent and relevant democratic innovations in the region within the international workshop and seminar on "Innovation in citizen participation and social control in public policies in Latin America, the Caribbean, and the European Union". In the framework of the panel and plenary session held on September 25th and 26th, she also introduced the contributions and methodological challenges faced when evaluating democratic innovations in the region—one of the cornerstones of the GIGAPP-LATINNO Special Working Group—, and some of the project's results regarding political experimentation and citizen participation in Latin America. This month, LATINNO's coordinator, Thamy Pogrebinschi, and the project's researchers Melisa Ross and Azucena Morán published an article in the WZB Mitteilungen. "Learning from Latin America: New models of participation strengthen women—and the democracy" reviews how, over the last two decades, many democratic innovations in Latin America have focused on empowering women by including them in policymaking processes, creating spaces for gender-responsive political experimentalism and breaking the digital gap. As participatory initiatives continue to develop throughout the region, lessons emerging from these experiences have diverted from the western logic of identity politics by interweaving gender, ethnicity and class struggles. In 2011, various civil society and government organizations, health professionals, political representatives, students, and national and international experts met to discuss the development of public policies and a public agenda on drug regulation in Uruguay. This dialogue emerged as a result of the need to address the issue from a human rights perspective, and the lack of efficient public policies. The three-day debate consisted of conferences, panels, workshops, and working sessions. The objective of the debate was to produce a document with the principles and strategies that are key to design a national drug policy. The National Council on Drug Policies, regulated on July 23rd, 2009, aims to monitor and update the National Policy on Drugs created by the National Secretariat on Drug Policies. The council’s responsibilities are to exercise normative guidance on actions directed toward the reduction of drug supply and demand; monitor and evaluate the resource management of the National Anti-Drug Fund and the performance of the National Policy on Drugs’ plans and programs; promote the integration of state, municipal and Federal District organs and entities within the National System Public Policies on Drugs. The project "Droga é caso de Política" (lit. Drugs are a case for policy) is a digital space implemented by the Brazilian Platform for Drug Policy (PBDB)— an organization born with the aim of creating links between specialists and civil society groups that work for the reform of drug policies in the country. This democratic innovation maps the political candidates who support the reform on at least one of the following three points: the decriminalization of drug use, the regulation of marijuana for therapeutic purposes, and/or the legalization of cannabis. In order to connect the electorate with these candidates, the platform asks politicians "why do we need to reform drug policy?" and publishes their answers online. Until August 2018, more than 130 candidates had sent their answers. Those politicians who support the reform and are not yet on the map can fill out an online form to be included.